The brightly coloured monorail car is shaped like a friendly beetle. It comes equipped with all the safety features: seat belts, hand rails and has a walkie talkie radio. The track winds up around the mountain and the journey takes about 70 minutes from start to finish. 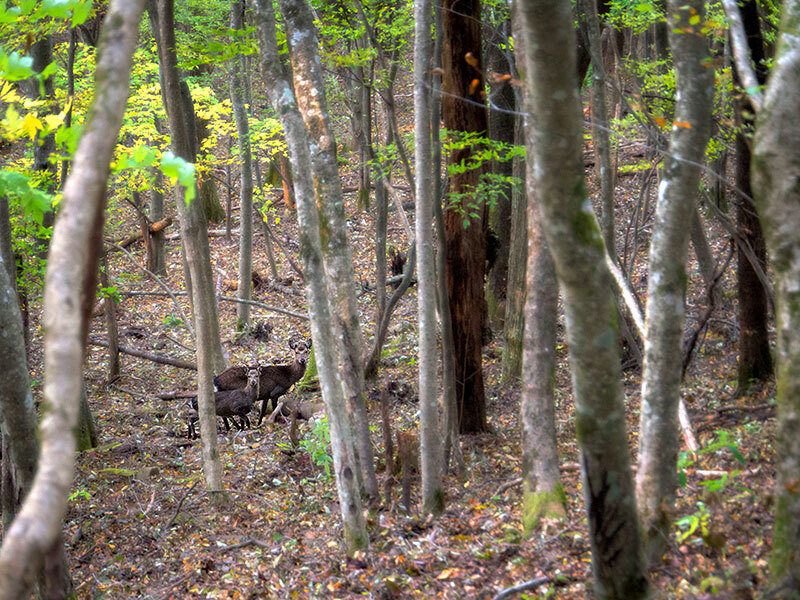 In the deep forest you may encounter some curious forest wildlife, including squirrels, birds and deer. 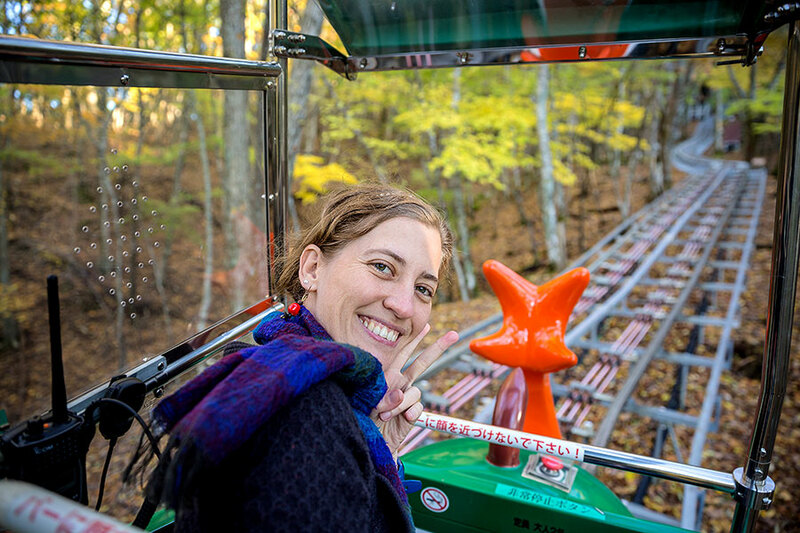 Each cart comes with two seats, so you can bring a friend along as photographer. Autumn, while chilly, is a chance to see the beautiful foliage changing in the hills of Tokushima. The final day of October was one of those beautiful autumn days with a clear, blue sky. 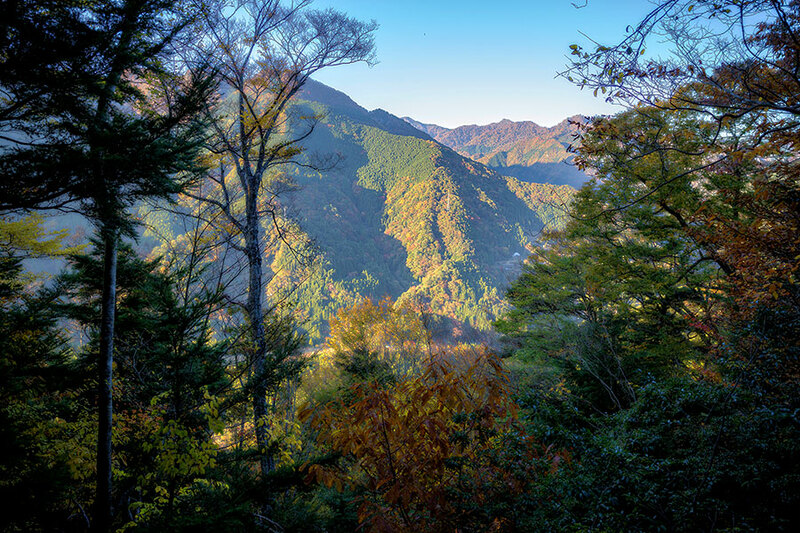 Surrounded by steep, forested mountains, the air is perennially fresh at the deep end of Tokushima’s Iya valley. It also receives far less visitors than the mouth of the valley, where the famous Kazurabashi vine bridges swing. We had ventured further in so we could try a bit of forest bathing via the Oku Iya monorail. The monorail boasts that it is the longest (4600m), highest (1380m), steepest, and has the greatest change in altitude (590m) of any sightseeing monorail in the world. It was originally conceived as a hiking trail, and has been in operation for over 11 years. In October, the monorail takes its last passengers for the day at 3:30pm. We arrived at 3:20pm, panting a little from racing up the stone path. Like a kid’s ride at an amusement park, the cars are lined up on the rail and painted in bright, primary colors. The operators instructed us to clip on our seatbelts, cautioning that we would sometimes ascend and descend at up to 40 degree angles. We went through a short safety briefing on how to use the walkie talkies, in case of a tree across the tracks, or some other issue — and then we were off! “It’s like a really slow roller coaster,” my friend Jason noted, as we crept towards the first, steep rise. Our seats jolted, a little dramatically, into position, as we ascended. We left the clearing behind, and entered the dim undergrowth of the cedar trees. Along the opposite tracks, a returning cart trundled into view, and we all waved enthusiastically at each other. As we climbed higher, past 850 meters, the foliage began to change from cedar plantation trees to natural scrub, more spread out, and thinner than the trees below. The late afternoon sun could now peak through more easily, giving a warm glow that matched the deepening oranges and yellows of the autumnal, deciduous forest. Forest bathing has become more popular in the last few years, seen as an answer to the stress of the modern world, work and life in cities. 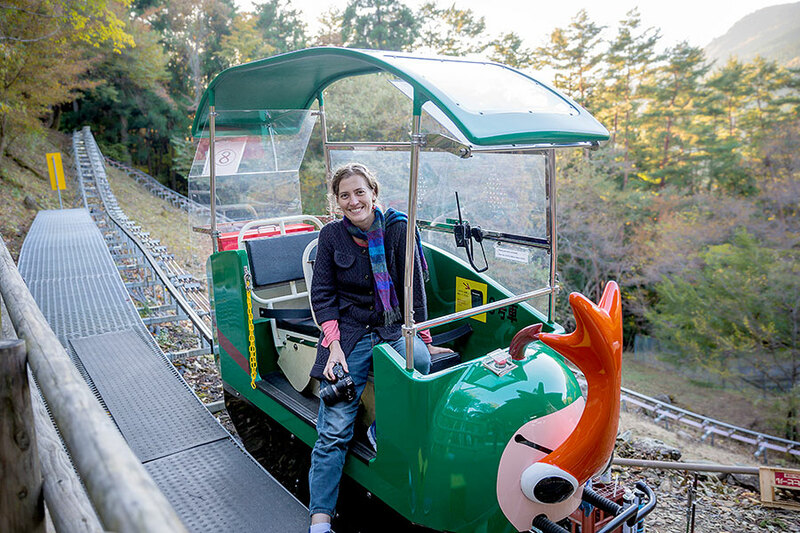 While hiking is an excellent way to forest bathe, and also good for your health, the monorail ride offers a chance to simply enjoy the scenery as it goes past. 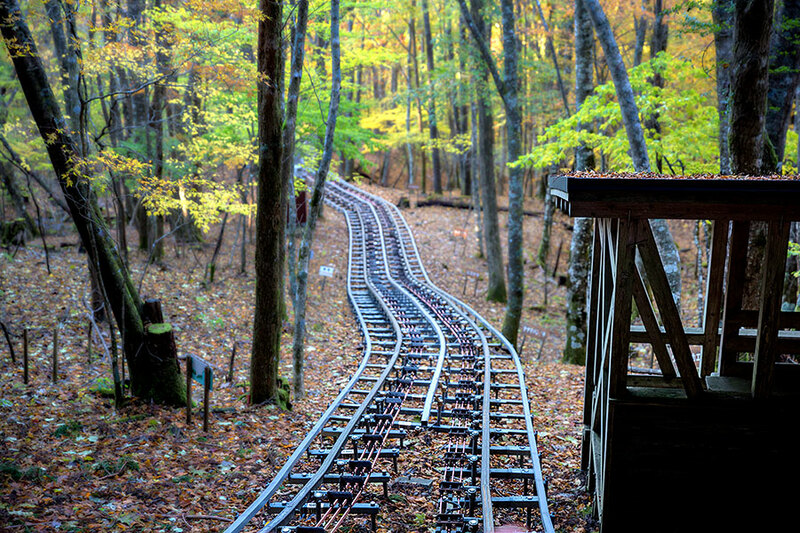 There are only so many pictures you can take of the forest, and the rail-line as it snakes through the trees. At some point, it became easier to just put away the camera and phone, and just take in the moment. It’s a long ride, about 70 minutes total, and I found myself becoming very calm, even meditative, despite the occasional, sudden adjustments of our seats. We saw birds drinking at the mountain stream; squirrels dashing beneath the rails; and a deer and her fawn who had stopped to watch us pass. We came up, finally, to the crest of the mountain, breaking free from the trees for a few chilly minutes. The lowering sun had warmed the colors of the nearby hills, and highlighted the few, tiny hamlets that still exist out here. The monorail looped around, and made its steep descent back down. As the operators shut up shop, they suggested we try out Iyashino Onsen in order to warm up. An excellent suggestion, which we enthusiastically followed. Chiiori - Discovering the charm of a traditional Japanese kominka.